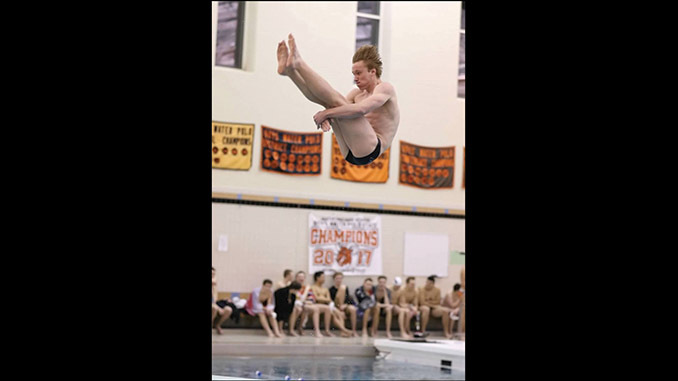 The Rockford Rams Men’s swim and dive team had their first home meet of the season this past week and hosted powerhouse Holland-West Ottawa High school. 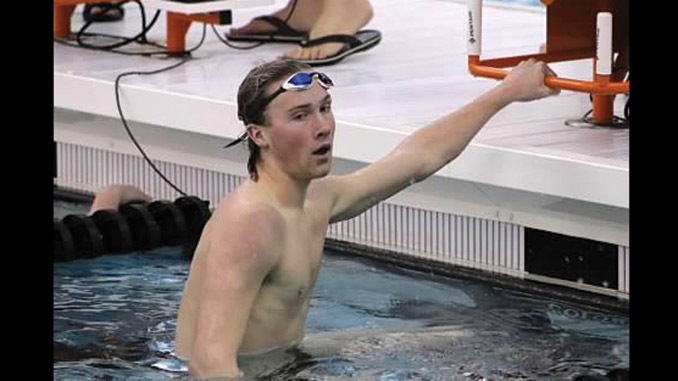 It was a tough meet with many events earning at least one D-1 state qualifying time, but the Rams hung in there and got some close finishes and a state cut of their own. The first event of the night was the 200 Yard Medley Relay and West Ottawa earned 1st, 2nd and 4th place to start the meet out strong. The all-senior Rockford team of Conner Dedert, Dwight Hua, Gavin Saur and Zach Burns finished strong with a time of 1:43.57 but it was only enough to earn them 3rd place. Following the Medley relay, was the 200 Free event and Zach Burns was able to keep pace with the first place finisher the entire race and earn a 1:49.65 time compared to Kevin Maas’ 1:49.22. Also scoring in the event for the Rams were junior, Elijah Chino and sophomore, James Rolewicz. 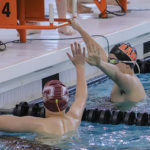 The third event was the 200 Yard Indvidual Medley and Logan Lovall, Dwight Hua and Ben Schuchardt all earned points for Rockford. The last event before the diving began was the 50 free. The first four finishers all finished in less than 23 seconds. Conner Dedert got 2nd with 22.32 and Kyle Arend placed 3rd with 22.72. Freshman, Nate Cheney also scored points for the Rams in this event. Rockford dominated in the diving event with points for all five of the Rams divers. Junior Austin Hintz won the diving portion with an individual score of 220 and sophomore Josh Vickery earned 217.80. They earned 8 and 6 points for the team respectively. The freshman trio of Ben Giera, Joshua Simkins and Isaac Gulliver also scored team points. Following six rounds of diving the next event was the 100 Butterfly. Gavin Saur, Nate Hopkins, Elijah Chino and Trey Williams all swam hard and scored team points. In the 100 free event, Kyle Arend swam fast and earned 2nd place with teammates Hudson Verwys and Isaiah Baker also scoring. In the nights’ longest distance swim, the 500-yard freestyle, Logan Lovall, Matt Weber and Drew Bargwell all earned points for the Rams. In the 200-yard freestyle relay the Rams A relay consisting of Kyle Arend, Nate Cheney, Dwight Hua and Gavin Saur worked hard to score. The 100-yard back stroke was the strongest swim event of the night for the Rams. Seniors, Zach Burns and Conner Dedert set the pace with 55 and 55.74 seconds respectively. Burns beat the 55.59 state qualifying time. Also scoring for Rockford were Ben Schuchardt and Cameron Trimble. The last individual event of the night was the 100-yard breast stroke and Dwight Hua, Elijah Chino and Brenden Saur all scored. The final event of the night was the 400-yeard free relay. 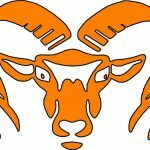 The three Rams relays scoring consisted of Kyle Arend, Zach Burns, Conner Dedert, and Logan Lovall; Gavin Saur, Cameron Trimble, Nate Cheney and Elijah Chino; and the third relay consisted of Nate Hopkins, Liam Smith, James Rolewicz and Mitch Rolewicz. The final score of the meet was Holland West Ottawa 182 – Rockford 126. The next meet is a home match against Grandville and will be senior night for Rockford on January 24. Come out and support the Ram men’s swim and dive team.